A Search for the Best Grilled Cheese of Gettysburg | The Gettysburgian. Over the past few weeks, I ventured across campus and into town in search of the best grilled cheese sandwich. Each sandwich was rated on four categories: cheese pull-ability, crust crispiness, price, and finally, wow factor. To start off the competition, I created my own grilled cheese sandwich at Servo. This option was the most economically friendly, as it only cost me one meal swipe. To make the perfect grilled cheese, I buttered both sides of whole grain bread. For pizazz, I sprinkled a dash of salt on each slice. I then added three slices of cheddar cheese and cook the sandwich on the panini press until golden brown. The sandwich fails the cheese pull test, but the crust is perfectly crisp without being too buttery. Making the perfect grilled cheese gives me a sense of accomplishment, but overall, the sandwich lacks the wow factor. All in all, the low price and convenience of this grilled cheese leads me to rate it a solid 3/5. Next up, I went to the Dive to try their rendition of the classic sandwich. Reasonably priced at $4.50, the sandwich is accessible to first-years, who would need to use dining dollars to purchase it. With two different cheeses layered between two slices of garlic bread, this sandwich makes an aesthetically-pleasing first impression. The appearance alone gives this sandwich the wow factor. Cheese enthusiasts will be impressed with the cheese pull-ability on this sandwich–it definitely ranks the highest in this category. However, where this sandwich falls short is the crust crispiness category. Though the garlic bread adds flavor, the butter takes away from the crispiness of the sandwich. Overall, this grilled cheese also earns a 3/5 from me. The next two sandwiches are available in town. At the Gettysburg Baking Company, the “Adult Grilled Cheese” can be purchased for $9.95. This grilled cheese is baked with the company’s fresh bread and includes avocado and bacon. It also comes with your choice of coleslaw, grapes, or couscous. This sandwich earns the highest wow factor. I have had this sandwich several times, and it never fails to impress me. The creaminess of the avocado is perfectly complemented by the crunchiness of the bacon. The cheese fails to do the cheese pull, but with the added ingredients, I can hardly fault the sandwich for lacking the pull. Though the sandwich is on the pricier side, it earns a full 5/5. This last sandwich comes from The Pub & Restaurant, one this investigation would be incomplete without mentioning. The spaghetti grilled cheese is the most expensive sandwich on the list, and it will set you back $13.50. To be honest, I was intimidated by this grilled cheese, but I ordered it after it was recommended to me by a friend. The sandwich earns high marks in the wow factor category, simply because of its creativity. Similar to the grilled cheese from the Dive, this sandwich is made with two slices of garlic bread, which pairs nicely with the spaghetti. However, this sandwich falls short when it comes to crust crispiness; most likely due to the tomato sauce. Eating this sandwich is fun, but it is not truly a grilled cheese. Overall, this sandwich earns a 4/5. 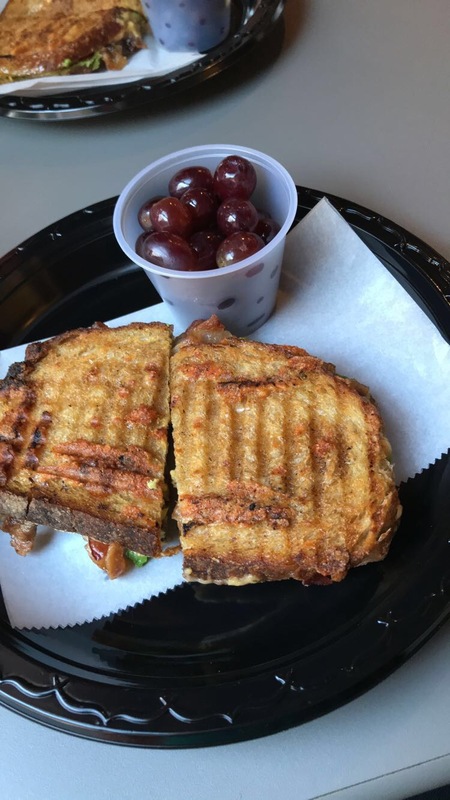 Though you can never go wrong with a grilled cheese, I would have to say that based off of cheese pull-ability, crust crispiness, price, and wow-factor, the “Adult Grilled Cheese” from the Gettysburg Baking Company is the winner! Kelsey DiPenta '21 is a staff writer for The Gettysburgian who writes primarily for the features section. She is from Mount Laurel, New Jersey and is majoring in Biology. Great article, but I do wish you included more pictures of the grilled cheese sandwiches.